The Asian Canadian Community Engagement Initiative (ACCE) and the Asian Canadian and Asian Migration Studies Program (ACAM) at the University of British Columbia are deeply saddened by the passing of alumnus and former member of the Board of Governors Joe Wai on January 11, 2017. Joe was beloved and respected by the many whose lives he touched with his beautiful designs, his commitment to social justice, and his visionary commitment to building a diverse and vibrant Vancouver. Between 1999-2002, Joe served on the UBC Board of Governors, where he helped bring awareness to the need for the University to engage more students and faculty in the study of Asian Canadian history, culture, and local communities. The Asian Canadian and Asian Migration Studies Program (ACAM), which was established in 2014, is a direct legacy of his commitment to enhancing teaching and community engagement at UBC. Joe was also a strong supporter of the UBC Learning Exchange. He mentored generations of activists and community leaders and was beloved for his humility, humour, and generosity. 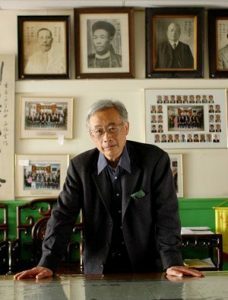 Born in Hong Kong to a trans-Pacific Chinese Canadian family, he moved to Vancouver in 1952 and first settled in Strathcona, a neighbourhood to which he would devote much of his life. After obtaining a degree in architecture from UBC in 1965, he worked in London before returning to Vancouver. He worked closely with the Strathcona Property Owners and Tenants Association (SPOTA) to fight attempts to build a freeway through the neighbourhood. He would go on to design important landmarks such as the Dr. Sun Yat-sen Classical Chinese Garden, the Chinese Cultural Centre Museum, and the Millennium Gate. These and other projects reflected his deep respect for the cultural heritage of the Chinatown area. He was also committed to providing accessible and affordable housing for area residents, and one of his last (uncompleted) projects was the renovation and expansion of the Villa Cathay Care Home to accommodate more Chinese-speaking seniors. ACAM and the members of ACCE would like to extend our sincere condolences to Joe’s family, friends, and colleagues. He is deeply missed.